Top Chef & Top Chef Masters are a couple of my favorite shows -- it manages to always make me hungry! I decided to feature one of the recipes that stood out to me this season, by Chef Art Smith. 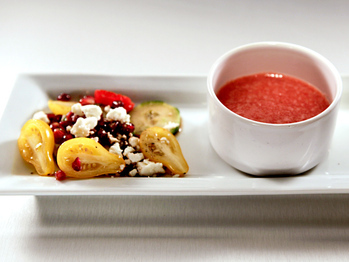 I's a tomato, cucumber, and pomegranate salad and watermelon soup. It sounds so summery but light, fresh, and refreshing. I think it's the perfect recipe to capture the last few summer days. 1. Toss ingredients and drizzle with balsamic vinegar and olive oil. 1. Puree watermelon and season with salt and pepper. Tear drop tomatos? I've never heard of them before! It looks yummy and perfect for the last days of summer. this looks so refreshing. I must try it. Looks so good and healthy! Oh yum oh yum! Always love Thursdays over here! I like the sound of that watermelon soup! It's looking great. Love it ! That salad sounds so good and refreshing!! I love pomegranate seeds, and feta cheese is delicious! I'm BEYOND obsessed with Top Chef. Like, to the point that it's a sickness. And Art Smith is one of my all-time favorites. This sounds so tasty! sounds really interesting and the photo is so pretty! definitely have to try these! That being said, that salad is going in my belly THIS WEEKEND. I'm obsessed with those kinds of salads, so thank you thank you thank you for giving us the recipe. Yay! Thanks for sharing this recipe, it looks so yummy, love that its healthy too.. Definitely trying this. It looks delicious! I would love to try it! Wow! I need some of this food in my life! It looks amazing but also healthy! I don't know what to think of watermelon soup. I haven't ever thought of it as a more savory dish, but now I want to taste it. The salad looks fresh and delicious! I've never had watermelon soup before, sounds intriguing! Yummy, I will have to try this. Thank you for sharing this. I will definitely try this. Come and visit our blog. Oh yum! What a great combo of flavors! This looks utterly delish! I am bookmarking--love watermelon anything! Hope you have a wonderful weekend! Is the watermelon soup refreshing? MUST TRY! I love tomatoes but I have never even heard of the tear drop variety! Sounds and looks delicious! Watermelon soup sounds sooo interesting. I don't know if I could eat a soup that tastes like fruit, haha. May have to try it though!! That looks delicious, so perfect! looks super appetizing, super-food for the taste palate as well for the mind& body!